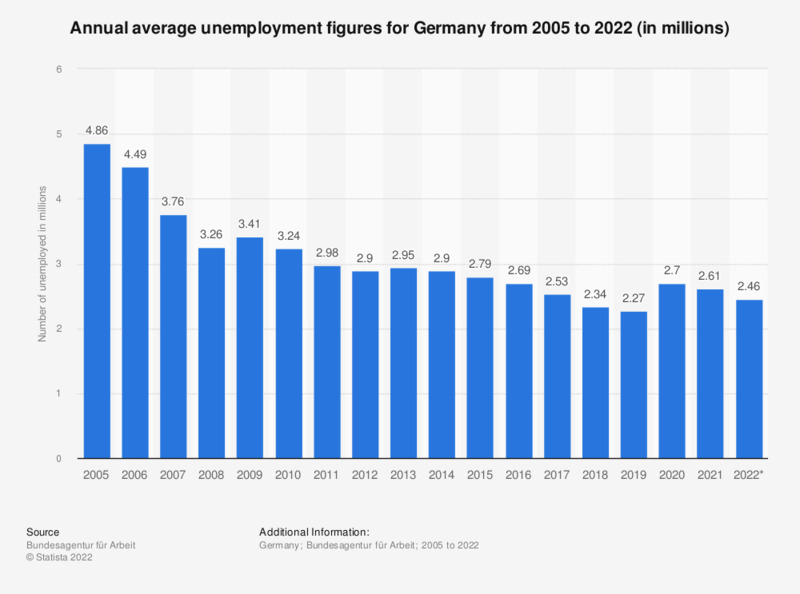 This statistic shows the annual average unemployment figures for Germany from 2004 to 2019. In 2019, approximately 2.41 million people were registered as unemployed on average. "Registered as unemployed" are those who are registered with the Bundesagentur für Arbeit or a similar association providing basic social care as "being out of a job (i.e. works less than 15 hours per week), looking for a job, available for the job market." This means that not every employable person in need is unemployed. Thus, persons who do not work are not automatically unemployed. * The figure for 2018 is referring to the figure from January. The data up to 2015 were taken from previous publications by the Bundesagentur für Arbeit.